For other uses, see Fernando de Noronha (disambiguation). Fernando de Noronha (Portuguese pronunciation: [feʁˈnɐ̃du d(ʒ)i noˈɾoɲɐ]) is an archipelago of 21 islands and islets in the Atlantic Ocean, 354 km (220 mi) offshore from the Brazilian coast. The archipelago's name is a corruption of the name of the Portuguese merchant Fernão de Loronha, to whom it was given by the Portuguese crown for services rendered regarding wood imported from Brazil. Only the homonymous main island is inhabited; it has an area of 18.4 km2 (7.1 sq mi) and a population estimated at 2,718 in 2012. The archipelago's total area is 26 km2 (10 sq mi). The islands are administratively unique in Brazil. 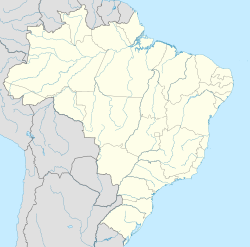 They form a "state district" (Portuguese: distrito estadual) that is not part of any municipality and is administered directly by the government of the state of Pernambuco (despite being closer to the state of Rio Grande do Norte). The state district's jurisdiction also includes the very remote Saint Peter and Saint Paul Archipelago, located 625 kilometres (388 mi) northeast of Fernando de Noronha. 70% of the islands' area was established in 1988 as a national maritime park. In 2001, UNESCO designated it as a World Heritage Site because of the importance of its environment. Its time zone is UTC−02:00 all year round. The local population and travelers arrive in Noronha by plane from Recife or Natal. Tourists are charged an "environmental preservation" daily fee upon arrival by Pernambuco State administration, while another fee is paid once to have access to the National Park attractions. The islands of this archipelago are the visible parts of a range of submerged mountains. It consists of 21 islands, islets and rocks of volcanic origin. The main island has an area of 18 km2 (6.9 sq mi), being 10 km (6.2 mi) long and 3.5 km (2.2 mi) wide at its maximum. The base of this enormous volcanic formation is 756 metres (2,480 ft) below the surface. The volcanic rocks are of variable though mainly silica-undersaturated character with basanite, nephelinite and phonolite among the lava types found. The main island, from which the group gets its name, makes up 91% of the total area; the islands of Rata, Sela Gineta, Cabeluda and São José, together with the islets of Leão and Viúva make up the rest. The central upland of the main island is called the Quixaba. The United Nations Environment Programme lists 15 possible endemic plant species, including species of the genera Capparis noronhae (2 species), Ceratosanthes noronhae (3 species), Cayaponia noronhae (2 species), Moriordica noronhae, Cereus noronhae, Palicourea noronhae, Guettarda noronhae, Bumelia noronhae, Physalis noronhae, and Ficus noronhae. The islands have two endemic birds — the Noronha elaenia (Elaenia ridleyana) and the Noronha vireo (Vireo gracilirostris). Both are present on the main island; Noronha vireo is also present on Ilha Rata. In addition there is an endemic subspecies of eared dove, Zenaida auriculata noronha. Subfossil remains of an extinct endemic rail have also been found. The archipelago is also an important site for breeding seabirds. An endemic sigmodontine rodent, Noronhomys vespuccii, mentioned by Amerigo Vespucci, is now extinct. The islands have two endemic reptiles, the Noronha wormlizard, Amphisbaena ridleyi, and the Noronha skink, Trachylepis atlantica. The life above and below sea is the main attraction of the island. Sea turtles, cetaceans (most common among these are spinner dolphins and humpback whales, followed by many others such as pantropical spotted dolphins, short-finned pilot whales, melon-headed whales), albatrosses, and many other species are frequently observed. The climate is tropical, with two well-defined seasons for rainfall, if not temperature. The rainy season lasts from February to July; the rest of the year sees little rain. The temperature ranges, both diurnal and monthly, are unusually slight. Many controversies mark the discovery of the archipelago by Europeans. At least three names – São Lourenço, São João, and Quaresma – have been associated with the island around the time of its discovery. Based on the written record, Fernando de Noronha island was discovered on August 10, 1503, by a Portuguese expedition, organized and financed by a private commercial consortium headed by the Lisbon merchant Fernão de Loronha. The expedition was under the overall command of captain Gonçalo Coelho and carried the Italian adventurer Amerigo Vespucci aboard, who wrote an account of it. The flagship of the expedition hit a reef and foundered near the island, and the crew and contents had to be salvaged. On Coelho's orders, Vespucci anchored at the island, and spent a week there, while the rest of the Coelho fleet went on south. In his letter to Soderini, Vespucci describes the uninhabited island and reports its name as the "island of St. Lawrence" (August 10 is the feast day of St. Lawrence; it was a custom of Portuguese explorations to name locations by the liturgical calendar). This account, reconstructed from the written record, is severely marred by the cartographic record. An island, named Quaresma, looking very much like Fernando de Noronha island, appears in the Cantino planisphere. The Cantino map was composed by an anonymous Portuguese cartographer, and completed before November 1502, well before the Coelho expedition even set out. This has led to speculation that the island was discovered by a previous expedition. However, there is no consensus on which expedition that might have been. The name "Quaresma" means Lent, suggesting it must have been discovered in March or early April, which does not correspond well with the known expeditions. There is also a mysterious red island to the left of Quaresma in the Cantino map that does not fit with Fernando de Noronha island. Some have explained these anomalies away by reading quaresma as anaresma (meaning unknown, but sidesteps the Lent timing), and proposing that the red island is just an accidental inkblot. Detail from the 1502 Cantino planisphere, showing the island of "Quaresma" (Fernando de Noronha?) off the Brazilian coast. Assuming Quaresma is indeed Fernando de Noronha, then who discovered it? One proposal is that it was discovered by a royal Portuguese mapping expedition that was sent out in May 1501, commanded by an unknown captain (possibly André Gonçalves) and also accompanied by Amerigo Vespucci. According to Vespucci, this expedition returned to Lisbon in September 1502, just on time to influence the final composition of the Cantino map. Unfortunately, Vespucci does not report discovering this island then – indeed he is quite clear that the first time he (and his fellow sailors) saw the island was on the 1503 Coelho expedition. However, there is a letter written by an Italian saying that a ship arrived "from the land of Parrots" in Lisbon on July 22, 1502 (three months before Vespucci). This could be a stray ship from the mapping expedition that returned prematurely, or another expedition altogether, about which we have no information. The timing of its reputed arrival (July 1502), makes it possible that it stumbled on the island sometime in March 1502, on the homeward voyage, well within Lent. A third possible (but unlikely) theory is that the island was discovered already in 1500, shortly after the discovery of Brazil by the Second India Armada under Pedro Alvares Cabral. After his brief landfall at Porto Seguro, Cabral dispatched a supply ship under either Gaspar de Lemos or André Gonçalves (sources conflict) back to Lisbon, to report the discovery. This returning supply ship would have returned north along the Brazilian coast and might have come across Fernando de Noronha island, and reported its existence in Lisbon by July 1500. However, this contradicts the Quaresma name, since the returning supply ship was sailing well after Lent. A fourth (but also unlikely) possibility is that it was discovered by the Third India Armada of João da Nova, which set out from Lisbon in March or April 1501, and arrived back in September 1502, also in time to influence the Cantino map. Chronicler Gaspar Correia asserts that on the outward voyage, the Third Armada made a stop on the Brazilian coast around Cape Santo Agostinho. Two other chroniclers (João de Barros and Damião de Góis) do not mention a landfall, but do report they discovered an island (which they believe to be identified as Ascension island, but this is not certain). So it is possible that the Third Armada may indeed have discovered Fernando de Noronha island on their outward leg. However, the timing is very tight: Easter landed on April 11, 1501, while the estimated departure date of the Third Armada from Lisbon ranges from March 5 to April 15, not leaving enough time to reach those environs within Lent. As a result of these anomalies, some modern historians have proposed that Fernando de Noronha is not depicted on the 1502 Cantino map at all. Instead, they have proposed that Quaresma island and the accompanying red "inkblot" are in fact the Rocas Atoll, slightly misplaced on the map. This reserves the discovery of Fernando de Noronha island itself as indeed on August 10, 1503, by the Gonçalo Coelho expedition, as originally reported by Vespucci. The transition of the name from "São João" to "Fernando de Noronha" was probably just natural usage. A royal letter dated May 20, 1559, to descendants of the Loronha family, still refers to the island by its official name of ilha de São João., but already in other places, e.g. the logbook of Martim Afonso de Sousa in the 1530s, it was referred to as the "island of Fernão de Noronha" ("Noronha" being a common misspelling of "Loronha"). The informal name eventually displaced the official name. The Lisbon merchant Fernão de Loronha held not only Fernando de Noronha island as a hereditary captaincy but also (from 1503 to around 1512) a commercial monopoly on trade in Brazil. Between 1503 and 1512, Noronha's agents set up a string of warehouses (feitorias) along the Brazilian coast, and engaged in trade with the indigenous peoples in Brazil for brazilwood, a native red dye wood highly valued by European clothmakers. Fernando de Noronha island was the central collection point of this network. Brazilwood, continuously harvested by the coastal Indians and delivered to the various coastal warehouses, was shipped to the central warehouse on Fernando de Noronha island, which was intermittently visited by a larger transport ship that would carry the collected loads back to Europe. After the expiration of Loronha's commercial charter in 1512, the organization of the brazilwood enterprise was taken over by the Portuguese crown, but Loronha and his descendents retained private ownership of Fernando de Noronha island itself as a hereditary captaincy, at least down to the 1560s. Captain Henry Foster stopped at Fernando de Noronha during his scientific survey expedition as commander of HMS Chanticleer, which had set out in 1828. As well as surveying coasts and ocean currents, Foster used a Kater invariable pendulum to make observations on gravity. He took the island as the point of junction of his double line of longitudes setting out his survey. He was given considerable assistance by the Governor of Fernando Noronha who let Foster use part of his own house for the pendulum experiments. The longitude of Rio de Janeiro taken by Foster was among those on one side of a significant discrepancy, which meant that the charts of South America were in doubt. Map of Fernando de Noronha, 1886. To resolve this, the Admiralty instructed Captain Robert FitzRoy to command HMS Beagle on a survey expedition. One of its essential tasks was a stop at Fernando Noronha to confirm its exact longitude, using the 22 chronometers on board the ship to give the precise time of observations. They arrived at the island in the late evening of 19 February 1832, anchoring at midnight. On 20 February FizRoy landed a small party to take the observations, despite difficulties caused by heavy surf, then sailed on for Bahia, Brazil that evening. "The whole island is one forest, & this is so thickly intertwined that it requires great exertion to crawl along. — The scenery was very beautiful, & large Magnolias & Laurels & trees covered with delicate flowers ought to have satisfied me. — But I am sure all the grandeur of the Tropics has not yet been seen by me. — We had no gaudy birds, No humming birds. No large flowers". His experiences on Fernando de Noronha were recorded in his journal, later published as The Voyage of the Beagle. He also included a short description of the island in his 1844 Geological Observations on the Volcanic Islands visited during the voyage of H.M.S. Beagle. The island was also used as a penal colony in the 19th century. In the late 18th century, the first prisoners were sent to Fernando de Noronha. A prison was built. In 1897 the government of the state of Pernambuco took possession of the prison. Between 1938 and 1945, Fernando de Noronha was a political prison. The former governor of Pernambuco, Miguel Arraes, was incarcerated there. In 1957 the prison was closed and the archipelago was visited by President Juscelino Kubitschek. At the beginning of the 20th century, the British arrived to provide technical cooperation in telegraphy (The South American Company). Later the French came with the French Cable and the Italians with Italcable. In 1942, during World War II, the archipelago was made a Federal territory, which included Rocas Atoll and Saint Peter and Paul Rocks. The government sent political and ordinary prisoners to the local prison. An airport was constructed in September 1942 by the United States Army Air Forces Air Transport Command for the Natal-Dakar air route. It provided a transoceanic link between Brazil and French West Africa for cargo, transiting aircraft and personnel during the Allies campaign in Africa. Brazil transferred the airport to the jurisdiction of the United States Navy on 5 September 1944. After the end of the war, the administration of the airport was transferred back to the Brazilian Government. Fernando de Noronha Airport is served by daily flights from Recife and Natal on the Brazilian coast. In 1988, Brazil designated approximately 70% of the archipelago as a maritime national park, with the goal of preserving the land and sea environment. On October 5, 1988, the Federal Territory was dissolved and added to the state of Pernambuco (except Rocas Atoll, which was added to the state of Rio Grande do Norte). Today Fernando de Noronha's economy depends on tourism, restricted by the limitations of its delicate ecosystem. In addition to the historical interest noted above, the archipelago has been the subject of the attention of various scientists dedicated to the study of its flora, fauna, geology, etc. The jurisdiction is considered to be a separate "entity" by the DX Century Club, and so is visited rather often by amateur radio operators. c) protection for endangered species, such as the hawksbill sea turtle (critically endangered) and various birds. In 2009, Air France Flight 447 disappeared off the northeast coast of Brazil. It was presumed to have crashed into the Atlantic Ocean off the coast of Fernando de Noronha. Rescue and recovery operations were launched from this island. Most of the original large trees were cut down in the 19th century, when the island was used as a prison, for firewood and to keep the prisoners from hiding and making rafts. Linseed, intended for use as cattle feed. Tegu lizards (Tupinambis merianae, locally known as teju) introduced in the 1950s to control a rat infestation. It did not work because Tegus are diurnal and rats, nocturnal. The lizards are now considered a plague, feeding mostly on bird eggs. Rock cavies (Kerodon rupestris, locally known as mocó) introduced by the military in the 1960s as hunting game for soldiers. Domestic cats, introduced as pets, now they spread throughout the whole island and several acquired a feral status, surviving only by preying on native birds, rock cavies and synanthropic rodents. From these, the domestic cat and the tegu lizard have become invasive. The island is divided between the Fernando de Noronha Marine National Park and the Fernando de Noronha Environmental Protection Area. The latter covers the urban, tourist area. Tourism including dolphin watching, diving and charter fishing comprise the majority of the island’s economy. The archipelago of Fernando de Noronha in 2005 had a Gross Domestic Product (GDP) of R$22,802,000 and a per capita income of R$10,001. The Human Development Index (HDI) district's state was estimated at 0.862 (PNUD/2000). The only banking center in the archipelago is a branch of Banco Santander Brasil. There are one or two additional ATMs around the main island. The beaches of Fernando de Noronha are promoted for tourism and recreational diving. The most popular ones include Baía do Sancho, Pig Bay, Dolphins Bay, Sueste Bay and Praia do Leão. Due to the South Equatorial Current that pushes warm water from Africa to the island, diving to depths of 30 to 40 metres (98 to 131 ft) does not require a wetsuit. The visibility underwater can reach up to 50 metres (160 ft). The part of the island facing the mainland has the beaches in the following order: Baía do Sancho, Baía dos Porcos, Praia da Cacimba do Padre, Praia do Bode, Praia dos Americanos, Praia do Boldró, Praia da Conceição, Praia do Meio and Praia do Cachorro. The part of the island facing the Atlantic Ocean has only 03 beaches: Praia do Leão, Praia do Sueste and Praia do Atalaia. A great way to get to know the island is to walk from Praia dos Americanos, pass by Praia do Boldró, Praia da Conceição, Praia do Meio and finish the walking at Praia do Cachorro. The island is served by Gov. Carlos Wilson Airport with regular flights to Natal and Recife. ^ IBGE (Brazilian Institute of Geography and Statistics) (2012). "IBGE - Cidades - Pernambuco - Fernando de Noronha - Estimativa da População - 2012" (in Portuguese). Retrieved 2013-10-20. ^ Government of the State of Pernambuco. "Administração Geral de Fernando de Noronha" [General Administration of Fernando de Noronha] (in Portuguese). Retrieved 2017-06-03. ^ "Fernando de Noronha - Pimentel lamenta suspensão de cruzeiro - Assembleia Legislativa do Estado de Pernambuco". Alepe.pe.gov.br. Retrieved 2014-05-17. ^ Noronha, Fernando de. "Aeroporto de Fernando de Noronha | Aviação para Fernando de Noronha | Horario dos voos para Fernando de Noronha | Companhia aera que opera para Fernando de Noronha - trip e total". www.ilhadenoronha.com.br. Retrieved 2017-10-13. ^ Carlos Secchin, Clóvis Barreira e Castro, Arquipélago de Fernando de Noronha, 2nd ed. 1991. ^ Sazima, I. and Haemig, P.D. 2012. Birds, Mammals and Reptiles of Fernando de Noronha. Ecology.Info 17. ^ Carleton, M.D. and Olson, S.L. 1999. Amerigo Vespucci and the rat of Fernando de Noronha: a new genus and species of Rodentia (Muridae, Sigmodontinae) from a volcanic island off Brazil's continental shelf. American Museum Novitates 3256:1–59. ^ Mausfeld, P., Schmitz, A., Böhme, W., Misof, B., Vrcibradic, D. and Duarte, C.F. 2002. Phylogenetic affinities of Mabuya atlantica Schmidt, 1945, endemic to the Atlantic Ocean archipelago of Fernando de Noronha (Brazil): Necessity of partitioning the genus Mabuya Fitzinger, 1826 (Scincidae: Lygosominae). Zoologischer Anzeiger 241:281–293. ^ Fernando de Noronha. "Clima em Fernando de Noronha". Ilhadenoronha.com.br. Retrieved 2014-05-17. ^ "Fernando De Noronha, Brazil: Climate, Global Warming, and Daylight Charts and Data". Climate Charts. 1961–1990. Archived from the original on November 1, 2014. Retrieved October 12, 2014. ^ "Climate Statistics for Fernando de Noronha, Brazil 1961–1990". National Oceanic and Atmospheric Administration. 1961–1990. Archived from the original Check |url= value (help) on December 9, 2014. Retrieved October 12, 2014. ^ An actual copy of this charter has never been found. Its contents and date, however, are summarized in a royal letter of March 3, 1522, confirming it, and yet another royal letter of May 20, 1559, identifying the location of São João precisely as Fernando de Noronha island. See Duarte Leite (1923: p.276–278) and Roukema (1963: p.21). ^ For an early reading of Quaresma as "Anaresma", see Henry Harrisse (1891) The Discovery of North America (1961 ed., p.319) and Orville Derby (1902) "Os mappas mais antigos do Brasil", Revista do Instituto Historico e Geografico de São Paulo, vol. 7, p.244. This reading was insisted upon later by historian Marcondes de Sousa (1949) Américo Vespúcio e suas viagens (São Paulo). It provoked a brief and surprisingly bitter controversy with other historians, e.g. Damião Peres, Duarte Leite. ^ The inkblot theory was suggested by Duarte Leite (1923: p.275–278). ^ The 1501 mapping expedition is also known as the "Third Voyage" of Amerigo Vespucci (and his first under the Portuguese flag). Amerigo Vespucci relates the account of this expedition twice - first in a letter to Lorenzo Pietro Francesco di Medici, written in early 1503 (see (account) in Letter do Medici), and then again in his letters to Piero Soderini, written 1504-05 ([account] in Letter to Soderini). In his account, Vespucci does not mention the name of the captain of this 1501 mapping expedition, and his identity has been widely speculated on. The 16th-century chronicler Gaspar Correia suggests it was André Gonçalves (Lendas da India, p.152). Greenlee (1945) reviews various possible names – and settles on the conjecture that it might be Fernão de Loronha himself (a hypothesis also suggested by Duarte Leite (1923)). But this is strongly disputed by other authors, e.g. Roukema (1963). It would be highly unlikely a prominent and wealthy merchant like Loronha would absent his businesses to go personally command vessels himself. Loronha's support (if any) to the mapping expedition was probably limited to financing. ^ This letter was written by Venetian emissary Pascualigo on October 12, 1502, and is quoted in the diary of Marino Sanuto. See Greenlee (1945: p.11n) and Roukema (1963:p.19). ^ Roukema (1963) accepts the hypothesis of a unrecorded separate expedition in 1501 - and that this might be the one led by André Gonçalves. However, Greenlee (1945) rejects the unrecorded expedition theory, deeming it superfluous, and instead embraces the stray ship theory (and that this stray ship was precisely the flagship personally commanded by Fernão de Loronha). ^ Roukema (1963) rejects this theory. ^ João de Barros, Decadas da Asia, vol.1, p.466; Damião de Góis, Chronica de D.Manuel, p.84. See Roukema (1963) on the possible problems of identifying the island discovered by the Third Armada on its outward leg as Ascension island. ^ Roukema (1963: p.19-22). Roukema concludes that it was the Rocas atoll that was discovered by the returning stray ship/unrecorded expedition on March 16, 1502, well within Lent. ^ "Image of 'sketches of the island of fernando noronha', south atlantic, 1828-1831". Science Museum. Science & Society Picture Library. Retrieved 2012-02-24. ^ a b FitzRoy, R. (1839) Narrative of the surveying voyages of His Majesty's Ships Adventure and Beagle between the years 1826 and 1836, London: Henry Colburn, pp. 24–26. ^ FitzRoy, R. (1839) Narrative of the surveying voyages of His Majesty's Ships Adventure and Beagle between the years 1826 and 1836, London: Henry Colburn, pp. 58–60. ^ Keynes, R. D. ed. (2001) Charles Darwin's Beagle diary. Cambridge: Cambridge University Press, p. 39. ^ Darwin, C. R. (1839) Journal and remarks. 1832-1836. London: Henry Colburn, 10–11. ^ Darwin, C. R. (1844) Geological observations on the volcanic islands visited during the voyage of H.M.S. Beagle, London: Smith Elder and Co., pp. 23–24. Greenlee, W.B. (1945) "The Captaincy of the Second Portuguese Voyage to Brazil, 1501–1502", The Americas, Vol. 2, p. 3–13. (in English) "Fernando de Noronha-Atol das Rocas moist forests". Terrestrial Ecoregions. World Wildlife Fund.